← Attending a Writing Conference? A Risk Worth Taking! I have waited a long time to write this history about myself. My wife came from a small lumber town not far from Seattle. 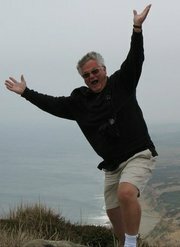 I met her while we were attending the University of Washington in the early 60’s and we were married after graduation. I don’t know about the rest of you, but I think ten year high school reunions should be eliminated. I believe God takes a pass and leaves the night to the Devil. There is simply too much drinking, flirting, bragging and too many inflated egos.Meanwhile the unfortunate spouses can either be bored, or they can choose to be obnoxious. And that would be me. Unfortunately, I knew some of my wife’s friends and met with them for drinks before the reunion began. I’m sure I was okay until dinner. My wife and I sat at a round table with five couples who were friends of hers. Since she and I lived in “the big city of Seattle,” I thought the funniest thing in the world would be to make fun of the towns’ annual Forest Festival weekend. Despite my wife kicking my leg until it bruised, I proceeded to make fun of the parade describing it as having a four piece marching band, two logging trucks, and kids marching with dogs; I also described in embarrassing detail the Indians coming out of the hills to watch the parade. Somehow the conversation changed at that point leaving me alone and neglected. It was only after dinner that my wife told me the sobering fact that the husband of one of her friends at the table was a full blooded Indian. It was uncharacteristic of me to be unkind about anything, let alone to be offensive. The only thing I could do was to find the guy, Wendell, and apologize. I found him alone in a hall and did my best in my most humble way to apologize. After I was done Wendell, with a sly grin told me a bunch of his brothers were on the way over to scalp me. After I had a nervous chuckle, we actually continued to have a pleasant talk. He was a great guy, told me about living on the reservation, actually in a tent, and that he was the only one in his family to graduate from college: Oregon State University. We shook hands and I made a promise I would not embarrass my wife or myself at her next reunion. I was true to my word at her twenty year reunion and had no drinks before dinner. I was determined to be the perfect gentleman. The dining arrangement was different this time with long tables placed in rows along the walls. We sat near the end of one table and I only had a glass of wine with dinner. There were close to 200 people there. After dinner my wife joined a group of her friends, leaving me alone and bored. There was a no host bar at the end of the room. I wandered down to it and bought some kind of drink. Then I roamed up the other side of the room until I found a table with a view of where my wife was still talking. She hesitated for a moment and then said, “No, but my wife is.” Although the room was dark, I suddenly realized he was a guy. He was sitting down, had long 70’s style hair, and a designer shirt…not a dress. I got up, didn’t say a word, and left to find a secluded place. He found me, sort of laughed about it, and he said he could hardly wait for the next reunion. And just so you know, at the next reunion he found me first before I could do anything else. We sat and shared stories for most of an hour. Since then we have corresponded and he and his wife even invited us to their 49th wedding anniversary dinner not long ago. There were two other couples and they insisted I tell this story. A little embarrassed, I did and everyone shared a good laugh. 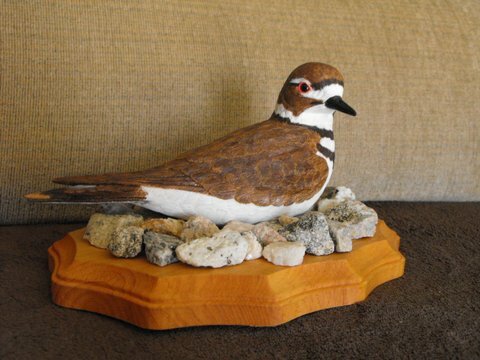 Also I have ordered a carving from him. 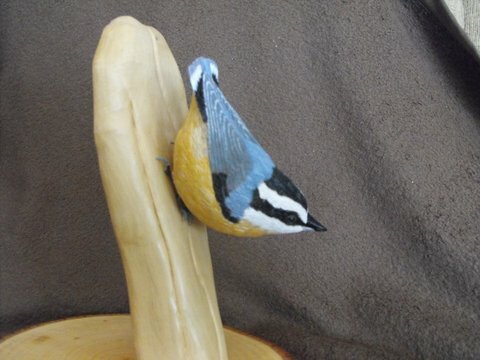 He is retired and does beautiful wood carvings of birds and fish as a hobby. There is a lesson here somewhere, but maybe you just have to live through it to find it. I have. This entry was posted in Humor, Nostalgia, Slice of life, Uncategorized and tagged Bill Borel, embarrasing reunion stories, high school reunions, humor, Reminiscence, reunions. Bookmark the permalink. Ouch, Bill! I feel your pain (but I still got a good chuckle from your story). Thank you for sharing.